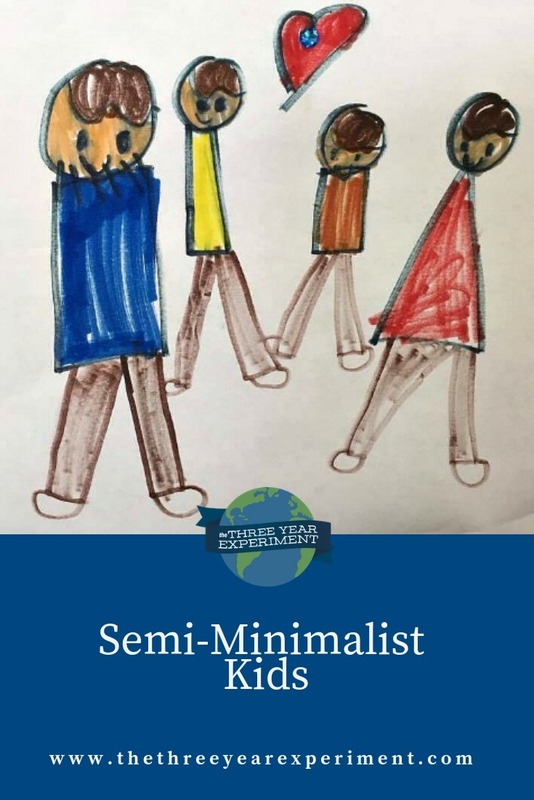 We’re minimalists because we don’t have arms. This is such an insightful comment on how we run our lives. We have access to so much information at our fingertips, but this increase in information does increase our anxiety as well. I know I constantly battle with myself over adequately preparing my kids for their adult lives: “Should they be taking piano lessons? I was taking piano lessons at their age. Music is so important. I want them to know how to read music, so that when they’re older, they’ll be able to play and enjoy making music. But when will we fit it in?” Never mind that between the two of them, they participate in drum lessons, basketball, soccer, Destination Imagination (I’m the coach), and Tae Kwan Do. Younger son’s bookshelf, pared down (I have trouble paring down books). Payne asks, “Are we building our families on the four pillars of “too much”: too much stuff, too many choices, too much information, and too fast?” He explains that too many choices is overwhelming and can actually chip away at our well-being. “Children are so clearly happiest when the have the time and space to explore their worlds, at play,” Payne says. And for my own kids, that is absolutely true. My six-year-old comes home from school every day, pulls out his markers and white copy paper, and draws or makes books. 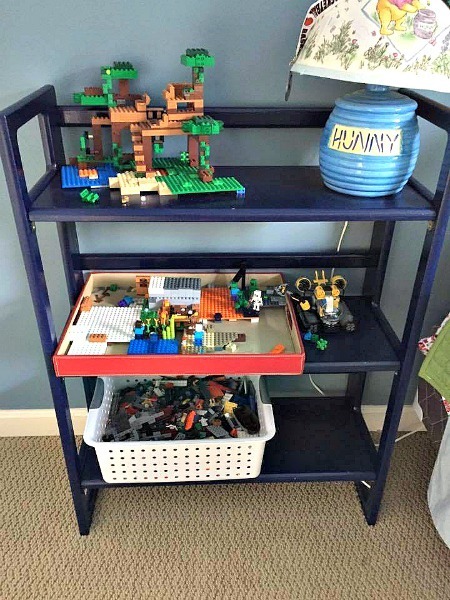 A year ago, he would come home from kindergarten and pull out his bin of Legos and make creations each day. My older son comes home, gets a snack, and tries to convince me that he needs to read for pleasure a couple of hours before he gets to his homework. If he had no homework, he would read all afternoon. But if we have after-school activities, that unobstructed creative time doesn’t happen (some kids have activities every single day). And they miss it. When we moved into our home five years ago, we packed up so many toys. Our entire basement was filled with toys of all shapes and sizes—most of them were plastic and made noise. 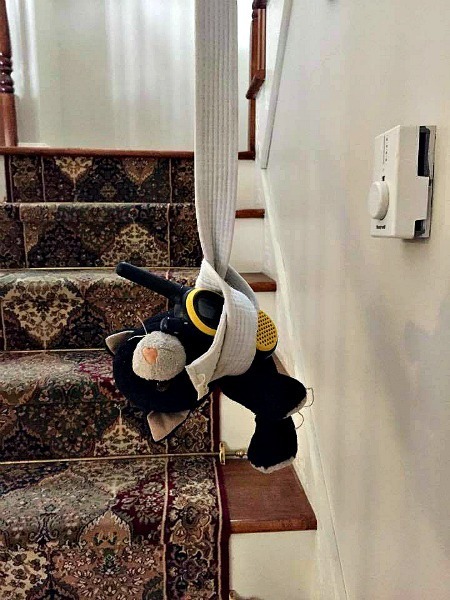 I think the kids would play in the basement once or twice a week, but the rest of the time, they’d play in the living room with whatever they happened to find laying around—dental floss tied to a squishy ball, a Tae Kwan Do belt connected to a bucket that they’d drag around. Kitty is on a secret spy mission to infiltrate the enemy’s lair and bring back secrets to the upstairs! My son had so many Legos that we’d put about a tenth of them in a bin and those were the only ones he played with. The others sat, ignored, in the basement. 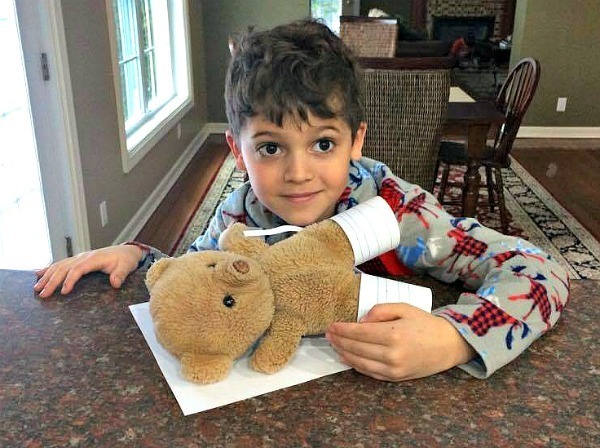 When I started minimizing our possessions a few years ago, I wasn’t sure how the kids would react to me getting rid of their toys, so I did an experiment. I cleaned out a ton of their basement toys—Play Mobile trucks, electronic wheels, car tracks, Star Wars figurines—and put them all in boxes which I hid in the storage closet. When they came home from school and saw their toys, they started playing. They didn’t say anything about the missing toys—ever! (In fact, in all my years of getting rid of toys, I have only had to bring back one PlayMobile ambulance). Because there were fewer toys to choose from, it was less overwhelming and they actually played a lot more in the basement over the next several weeks. After I wrote the post Semi-Minimalist Home, I noticed that the kids’ rooms had gotten full of stuff again. At Christmas, they got so many presents that they were overwhelmed with toys. So I went into their rooms, and got rid of almost all of the toys. I put them in boxes and bags in the basement again. I also put away most of their books. Now, I know this might strike horror in some readers, but Payne makes a good point. If choice is overwhelming to us as adults, it’s doubly overwhelming to kids. Although we don’t necessarily like to reread books as adults, children love to reread books (I can definitely attest to this! How many do I know by heart because I’ve been asked to read them every night for months?). Kids would prefer to internalize the same book, over and over again. This is my son’s book collection, now pared down substantially (he had a lot of books before!). This is even true for my nine-year-old voracious reader. He reads extremely fast and goes through books like water, but he’d prefer one at a time, and checks them out of our online library. I’ve decreased the books in his bookshelves by a lot, and he’s a lot more apt to go back and reread his paper books again and again, now that there are less on the shelf. I store the extras in drawers in the guest room and change them out occasionally. 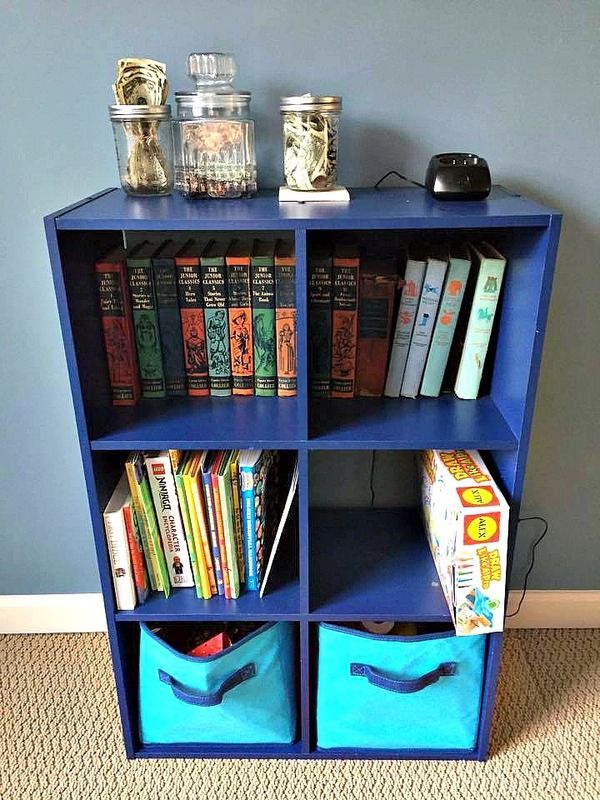 After I pared down their rooms, the boys actually said, “Wow! 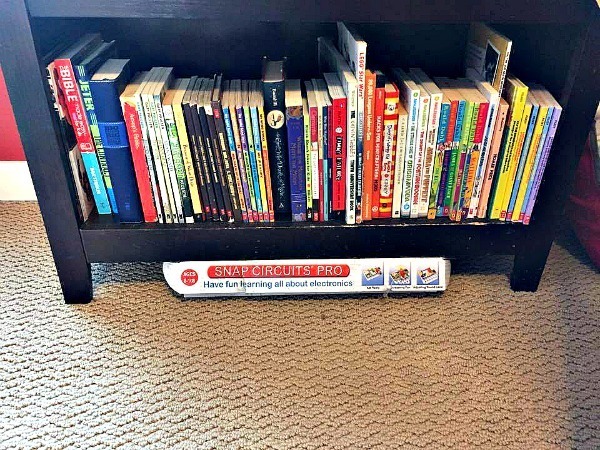 Thanks for cleaning our rooms!” My oldest son said, “Mom, I love it when you organize my bookshelf. You should do it monthly.” They still haven’t noticed the toys I took away. In fact, my youngest son told me yesterday I should get rid of some of his Legos because he had too many. This was after I’d taken away half! Their toys now consist of a box of Legos, a set of Snap Circuits, and a cabinet full of craft supplies: one pack of crayons, one pack of markers, copy and construction paper, and a few odds and ends (glue, scissors, tape, beads, pipe cleaners). Oh, and eleven stuffies, walkie-talkies, a box of PlayMobiles, blocks, two glow-in-the-dark car tracks…. Ok, we’re definitely still minimalizing. But the kids only play with a few of their toys, even with so few. They gravitate towards the toys that are simple and that they can manipulate, like the Legos and craft supplies. The others are never played with, and if I got rid of them, I doubt the kids would even notice. When they have less toys, they tend to be much more creative in their play. Yes, we have cut-up boxes all over the house, paper, tape, and Legos in every room, but that’s a small price to pay for allowing our kids to invent worlds of their own, dream, and imagine. Every time I feel the need to enroll them in more lessons, I have to pull back and think. I have to resist the frantic pull of what I feel are the thousands of activities other parents have their kids in, and realize that what we’re doing is enough. It’s nice to follow other blogs dedicated to simple living, like Art of Simple to realize that others are working through some of these same issues. 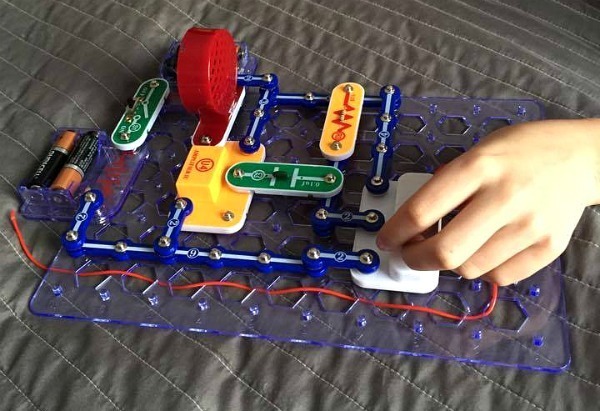 My older son’s favorite toy from Christmas (which he asked for) was a set of Snap Circuits. He’s showing off an FM radio he’s just built. I asked my son last week what his favorite activity was, out of everything that he did. “It’s Tech Team, Mom,” he said. That clarifying question got me thinking about what types of activities we should pick for next year (correction–he should pick for mext year). I believe he will get more out of a concentrated focus on one or two activities that he loves than on less exposure to many things. It also frees up our schedule so the boys have time to explore outside and be bored on occasion. Our household is still very much a work in progress. For example, though they’re not allowed to use electronics during the week, they play a ton of electronics on weekends. This is a total overload of information and visual stimulation, but Hubs and I get so tired and electronics is a respite, honestly. Hopefully, next year, once my Masters classes are over, we’ll work on this. Stuffy has two broken legs and a crutch! He’ll have to be in bed for a month. And holidays and birthdays are definitely a work in progress. We still get (and give!) plenty of toys, especially Legos! (That company is genius when it comes to marketing to kids). But we’ve started asking for more experiential gifts from grandparents and extended family. They’ve gotten ski passes, weeks at camp, and day trips. We always try to take a picture during the activity and send it to the giver. At the end of our three year experiment, we’re planning to move abroad. We’re still not sure where we’ll end up, but we know what we want: shared experiences as a family. As we work toward our goal over the next three years, we are working on building more of those shared experiences. Less stuff makes that possible, as it frees up money and mental bandwidth. We are slowly working to free our and our kids’ dependence on material objects and to enjoy the best things life has to offer: time together, time outdoors, food, and laughs. If you have kids, what are the tricks you’ve used to tame the toy beast?